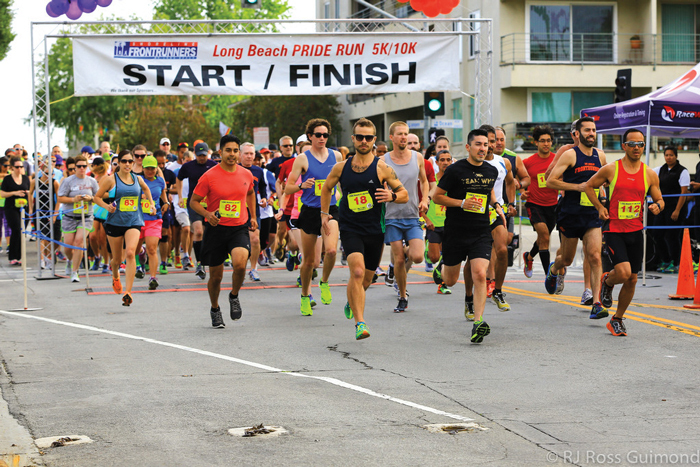 As Long Beach Pride celebrated its 32nd year, it was the event’s Pride Run hosted by the Shoreline Frontrunners that burned the socks off its participants. This year the race had the pleasure of running on the new composite running/walking path that was constructed for the citizens of Long Beach. As is becoming the new normal for Pride races, there were two runs available for participants – a 10K (or 6.2 mile) race and a 5K (or 3.1 mile) race. This year marks the third time the race was held on the same day as the Pride Parade. While there was a slight decrease in participants this year, it was hard to notice as the excitement and energy overcame everyone there. Most exciting, however, was that a good 70 percent of those who participated this year were new runners. According to Mike Klyde, organizer of the Long Beach Pride Run, this was an impressive feat considering how little the Shoreline Frontrunners did to publicize the event. They even managed to snag a lovely lady from Scotland on her honeymoon. Shona McManus, on just her second day in the United States, managed to knock the socks off the 10K participants. She was not only the first female to finish but also came in third overall with an impressive time of 40 minutes and 12 seconds (40:12). What is nice about the Pride Runs in Southern California is that it is not uncommon for fellow Frontrunners from different clubs to occasionally drop by and run as well. As was expected in the Long Beach Pride Run, a good majority of the Los Angeles Frontrunners participated, even having one of their former runners win the 5K race. Eric Alvarez, now a native of Tennessee, managed to slide right into the first place spot with an impressive time of 17:02. Coming in second, and less than 15 seconds behind Eric, was Jose Rojas, another LA native who managed to finish at 17:15. While both races are equally competitive, each holds a separate running factor that differentiates it from the other. Whereas the 5K is short and quick, the 10K requires endurance and discipline. Alvarez stated that the hardest part for him was the second mile of the 5K, which, when I ran the 10K, the toughest part was the fourth mile. Both are past the halfway marks of their respective races, however the 10K is a game of pace and race. While I won the race at 37:45, I slowed down a lot on my fifth mile, completing it at only 6 minutes and 29 seconds. Overall, the Long Beach Pride Run is a great race. Its simplistic course keeps runners from getting lost and allows them to enjoy the beautiful Southern California weather while participating in a quick, yet easy race. For those interested in participating next year, check out the Shoreline Frontrunners website at http://wp.shorelinefrontrunners.org. Normal pricing is only $35 but if you are 24 years old or younger it is only $25.